I wanted to start doing more day trips but I didn't have a suitable bag and the Atmos 50 was a bit large for a 5-10 mile day. I did use it for such when I first got it just to test out the load and see how things worked before I took in on a weekend trip but, I didn't want to look like a total dork carrying around a large pack for some water and a lunch. So, the hunt for a daypack began. I started out looking at CamelBak's gear. I am usually drawn to visual appeal from the onset and then begin looking at features. I think a similar thing occurs when looking for a mate in life. It's not so much that you need something that looks good but it's nice to have something you're proud of wearing around. Functionality is a key component though and I don't dismiss it. In fact, after my eyeball appeal is over, if something doesn’t offer functionality then I will discard and start the hunt all over. So, the CamelBak's has the visual appeal and most had the functionality however I was having a hard time finding the size, price, functionality options that I wanted in one bag. I began looking at Black Diamond equipment as well and they had awesome functionality and great pricing but the visual appeal was lacking for me. So I went back to what I trusted, Osprey, and I liked what I saw. So, I picked up the Manta 20. It looked good, offered a water bladder with the bag, and had plenty of storage. I was already familiar with the AirSpeed on my Atmos 50 and the Manta has a miniature version of this. So, plus one from the start. I love the AirSpeed and it's nice on sweaty days plus it gives a nice cushion so you don't feel like you have a rock on your shoulder blades. Next the 3L HydraForm hydration pack was definitely the reason why I ended up with this bag. The other Osprey's offered a water bladder but this one had it plus it was at a good price. The CamelBak, although nice, were priced at a considerably higher rate and some didn't even offer the water bladder along with the bag purchase. I had to have an all in one system. The main compartment is mostly the water bladder however there is a long slim pocket that follows the length of the bag which is great for extra clothing, rain gear, and your food. The next pocket (outlined in yellow) is a cushioned pocket for electronics and sunglasses and is located on the upper portion of the bag to keep you from crushing your expensive gear on a tumble or when taking a break and tossing the bag down. The front zippered pocket has a couple compartments available and I kept my first-aid kit and other easily accessible items here, like keys and wallet. On the outside of this pocket is another one of Osprey's signature stretchy pockets. I love these pockets as they're magically in just how much junk can be crammed into them. I didn't utilize it all that much though but might be great in the summer to keep a sweat soaked towel in to dry as you hike. The waist belt also offers a pocket per side. I admit these pockets are pretty tiny and when strapped in they were a bit difficult to get into, unlike it's larger cousin the Atmos, which are much easier to use. Although I doubt I will use those pockets for much, other than some chapstick or a hankie, so it's not a deal breaker for me. Lastly, on the very bottom is a built in rain cover for the pack, which was a feature that I didn't even notice until I started playing with the bag. Unzip the little pocket and out rolls your own pack cover. The pocket is large enough that if needed I am sure you could cram something else in there. It was a pleasant surprise to find this. So not only did I get all the functionality I wanted, I even got a bonus! 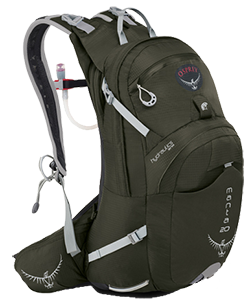 Since I am already used to Osprey straps and webbing this was pretty much standard fair for me. The typical shoulder straps that are ergonomic to the chest (the women's version is shaped a bit differently) along with a chest and minimal waist belt. I went for a large version so the waist belt was closer to my waist. All of the pictures I saw on the website were featuring the belt being worn much higher for those riding bikes or what-not. I wasn’t too keen on having a stomach belt so make sure you try this thing on and decide what size to get. Lastly, for those that are into climbing or biking, there is a helmet clip on the upper portion of the bag. Since I don't do either I just tossed on a carabiner for easy access to a bear/emergency whistle and anything else that I might want to dangle on there. I'm not one to make snap decisions on purchases. 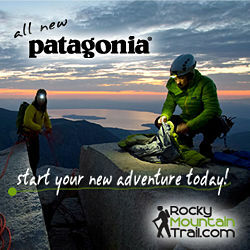 Most outdoor gear costs a pretty penny and I am not rich. I want to make sure I am getting my money's worth, so this purchase took a while before I made it. I did like what I saw with CamelBak but when I could get the same features for much less and get the water bladder included, it was an easy decision for me. I would definitely recommend the Manta 20 for day hikes, biking, climbing outings, or even just to have an emergency bag in the car. I trust in Osprey's quality construction and comfort since this is now my second Osprey bag.